Cities: Capital--Bogota (pop. 2005 projected: 7.1 million). Other major cities include Medellin, Cali, Barranquilla and Cartagena. Ethnic groups: Mestizo (58%), white (20%), mulatto (14%), black (4%), mixed black-Amerindian (3%) and Amerindian (1%). Major political parties: Conservative Party of Colombia, Liberal, National Unity, Radical Change, Alternative Democratic Pole, and numerous small political movements. Colombia maintains an embassy in the United States at 2118 Leroy Place NW, Washington, DC 20008 (tel. 202-387-8338). Consulates are located in Atlanta, Boston, Chicago, Houston, Los Angeles, Miami, New York, San Francisco, San Juan and Washington D.C.
GDP (2005): $123.7 billion; base year 1994: $105.9 billion. Annual growth rate (2005): 5.1%. Government expenditures (2005): 22.7% of GDP. Manufacturing (14.4% of GDP): Types--textiles and garments, chemicals, metal products, cement, cardboard containers, plastic resins and manufactures, beverages, wood products, pharmaceuticals, machinery, electrical equipment. Agriculture (13.1% of GDP): Products--coffee, bananas, cut flowers, cotton, sugarcane, livestock, rice, corn, tobacco, potatoes, soybeans, sorghum. Cultivated land--8.2% of total area. Other sectors (by percentage of GDP): Financial services--17.1%; commerce--11.2%; transportation and communications services--7.9%; mining and quarrying--4.5%; construction and public works--5.4%; government, personal and other services--18.6; electricity, gas, and water--2.9%. Trade: Exports (2005)--$21.1 billion: petroleum, coal, coffee, flowers, textiles and garments, ferronickel, bananas, chemicals, pharmaceuticals, gold, sugar, cardboard containers, printed material, cement, plastic resins and manufactures, emeralds. Major markets--U.S., Venezuela, Germany, Netherlands, Japan. Imports (2005)--$21.2 billion: machinery/equipment, grains, chemicals, transportation equipment, mineral products, consumer products, metals/metal products, plastic/rubber, paper products, aircraft, oil and gas industry equipment, supplies. Major suppliers--U.S., Germany, Japan, Panama, Venezuela. The first permanent settlement in Colombia was at Santa Marta, founded by the Spanish in 1525. Santa Fe de Bogota was founded in 1538 and, in 1717, became the capital of the Viceroyalty of New Granada, which included what are now Venezuela, Ecuador, and Panama. Bogotawas one of three principal administrative centers of the Spanish possessions in the New World. 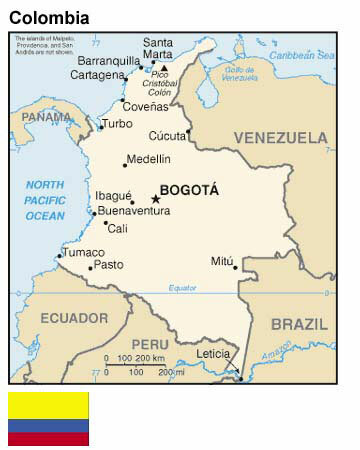 On July 20, 1810, the citizens of Bogota created the first representative council to defy Spanish authority. Full independence was proclaimed in 1813, and in 1819 the Republic of Greater Colombia was formed. The new republic included all the territory of the former Viceroyalty (Colombia, Venezuela, Ecuador and Panama). Simon Bolivar was elected its first president with Francisco de Paula Santander as vice president. Conflicts between followers of Bolivar and Santander led to the formation of two political parties that have since dominated Colombian politics. Bolivar's supporters, who later formed the nucleus of the Conservative Party, sought strong centralized government, alliance with the Roman Catholic Church and a limited franchise. Santander's followers, forerunners of the Liberals, wanted a decentralized government, state rather than church control over education and other civil matters and a broadened suffrage. Throughout the 19th and early 20th centuries, each party held the presidency for roughly equal periods of time. Colombia maintained a tradition of civilian government and regular, free, elections. Notwithstanding the country's commitment to democratic institutions, Colombia's history also has been characterized by widespread, violent conflict. Two civil wars resulted from bitter rivalry between the Conservative and Liberal parties: The War of a Thousand Days (1899-1903) claimed an estimated 100,000 lives, and La Violencia (the Violence) (1946-1957) claimed about 300,000 lives. The assassination of Liberal leader Jorge Eliecer Gaitan in 1948 sparked the bloody conflict known as La Violencia. Conservative Party leader Laureano Gomez came to power in 1950, but was ousted by a military coup led by General Gustavo Rojas Pinilla in 1953. When Rojas failed to restore democratic rule and became implicated in corrupt schemes, he was overthrown by the military with the support of the Liberal and Conservative Parties. It was out of this alliance between the two parties that the National Front emerged, which ended "La Violencia." In July 1957, former Conservative President Laureano Gomez (1950-53) and former Liberal President Alberto Lleras Camargo (1945-46) reached an agreement that led to the creation of the National Front, under which their parties would govern jointly. The presidency would be determined by regular elections every 4 years and the two parties would have parity in all other elective and appointive offices. This system was phased out by 1978. During the post-National Front years, the Colombian Government made efforts to negotiate a peace with the persistent guerrilla organizations that flourished in Colombia's remote and undeveloped rural areas. In 1984, President Belisario Betancur, a Conservative, negotiated a cease-fire with the Revolutionary Armed Forces of Colombia (FARC) and the Democratic Alliance/M-19 (M-19) that included the release of many imprisoned guerrillas. The National Liberation Army (ELN) rejected the government's cease fire proposal at that time. The M-19 pulled out of the cease-fire when it resumed fighting in 1985. The army suppressed an M-19 attack on the Palace of Justice in Bogota in November 1985, during which 115 people were killed, including 11 Supreme Court justices. The government and the M-19 renewed their truce in March 1989, which led to a peace agreement and the M-19's reintegration into society and political life. The M-19 was one of the parties that participated in the process to enact a new constitution (see below), which took effect in 1991. The peace process with the FARC did not enjoy similar success; the FARC ended the truce in 1990 after some 2,000-3,000 of its members who had demobilized had been murdered. The enactment of a new Constitution in 1991 brought about major reforms to Colombia's political institutions. While the new Constitution preserved a presidential, three-branch system of government, it created new institutions such as the Inspector General, a Human Rights Ombudsman, a Constitutional Court and a Superior Judicial Council. The new Constitution also reestablished the position of Vice President. Other significant constitutional reforms provide for civil divorce, dual nationality and the establishment of a legal mechanism ("tutela") that allows individuals to appeal government decisions affecting their constitutional rights. The Constitution also authorized the introduction of an accusatory system of criminal justice that is gradually being instituted throughout the country, replacing the previous written inquisitorial system. A Constitutional amendment approved in 2005 allows the president to hold office for two consecutive 4-year terms. Colombian governments have had to contend with the combined terrorist activities of left-wing guerrillas, the rise of paramilitary self-defense forces in the 1990s and the drug cartels. Narco-terrorists assassinated three presidential candidates during the election campaign of 1990. After Colombian security forces killed Medellin cartel leader Pablo Escobar in December 1993, indiscriminate acts of violence associated with his organization abated as the "cartels" were broken into multiple, smaller and often-competing trafficking organizations. Guerrillas and paramilitary groups also entered into drug trafficking as a way to finance their military operations. In December 2003, the Colombian Self-Defense Forces (AUC) paramilitary group entered into a peace agreement with the government that has led to the bloc by bloc demobilization of over 30,000 AUC members. In addition, over 9,000 members of the AUC and other illegal armed groups have individually decided to surrender their arms. In July 2005, President Uribe signed the Justice and Peace Law, which established a legal framework for these demobilizations. Under this law, participants have to renounce violence and return illegal assets in exchange for reduced punishments; the assets are to be used to provide reparations to victims. The ELN and the government began a round of talks with the Colombian Government mediated by the Mexican Government in mid-2004. The ELN withdrew from the talks after the Mexican Government voted to condemn Cuba's human rights record at the United Nations in April 2005. In December 2005, the ELN began a new round of talks with the Colombian Government in Cuba that led to two more meetings, the last one held in April 2006. The dialogue is expected to continue. As a result of the government's military and police operations, the strength of the FARC has been reduced in major areas, drastically in some areas. Since 2000, the FARC has not carried out large scale multi-front attacks, although it has more recently mounted some operations that indicate it has not yet been broken. The FARC has rejected several government proposals aimed at bringing about an exchange of some 63 hostages being held for political reasons. Three American citizens, who were working on counternarcotics programs, were captured by the FARC in February 2003. Their safe return is a priority goal of the United States and Colombia. Colombia maintains an excellent extradition relationship with the United States. The Uribe administration has extradited more than 400 fugitives to the United States. Among those extradited in 2005 were Cali Cartel leaders Gilberto Rodriguez Orejuela and his brother Miguel and FARC leaders Juvenal Ovidio Palmera Pineda (aka "Simon Trinidad") and Omaira Rojas Cabrera (aka "Sonia"). The Uribe government established, for the first time in recent Colombian history, a government presence in all of the country's 1,098 municipalities (county seats). Attacks conducted by illegally armed groups against rural towns decreased by 91% from 2002 to 2005. Between 2002 and 2005, Colombia saw a decrease in homicides by 37%, victims of massacres by 63% and kidnappings by 72%. Aerial spraying of coca crops and cocaine and heroin interdictions are setting records. Although much attention has been focused on the security and military aspects of Colombia's situation, the Uribe government also is making significant efforts on issues such as expanding international trade, supporting alternate means of development and reforming Colombia's judicial system. In Congressional elections on March 12, 2006, the three leading pro-Uribe parties (National Unity, Conservative Party and Radical Change) won clear majorities in both houses of Congress. President Uribe was reelected by 62 percent of the vote on May 28, 2006, and sworn into office for a second term on August 7. Colombia's Ministry of Defense, charged with the country's internal and external defense and security, exercises jurisdiction over an army, navy--including marines and coast guard--air force and national police under the leadership of a civilian Minister of Defense. Real spending on defense has increased every year since 2000, but especially so under President Uribe. Colombian spending on defense grew over 30% after inflation from 2001 to 2005, from $2.6 billion to more than 3.9 billion. Projected defense spending for 2006 is $4.48 billion. The security forces number about 350,000 uniformed personnel: 190,000 military and 160,000 police. President Uribe instituted a one-time wealth tax in 2002, which raised over $800 million, with 70% used to increase 2002-2003 defense spending. Actual Ministry of Defense spending in 2004 has increased to 16.3% of the overall national budget, up from 12.9% in 2002, and is the third largest expenditure after social protection programs and education. Many Colombian military personnel receive training in the United States or in Colombia. The United States provides equipment to the Colombian military and police through the military assistance program, foreign military sales and the international narcotics control program. The Colombian Government is committed to the eradication of all illicit crops, interdiction of illegal drug shipments and financial controls to prevent money laundering. Between May 2002 and September 2004, Colombian security forces interdicted 558 metric tons of cocaine, coca base, and heroin. Coca and poppy cultivation has decreased by 33% since 2001. Terrorism in Colombia both supports and draws resources from the narcotics industry. Colombia's narcoterrorists have kidnapped over 50 American citizens since 1992, and killed at least 10. Colombia is a free market economy with major commercial and investment ties to the United States. Transition from a highly regulated economy has been underway for more than a decade. In 1990, the administration of President Cesar Gaviria (1990-94) initiated economic liberalization or "apertura," and this has continued since then, with tariff reductions, financial deregulation, privatization of state-owned enterprises and adoption of a more liberal foreign exchange rate. These policies eased import restrictions and opened most sectors to foreign investment, although agricultural products remained protected. Unlike many of its neighboring countries, Colombia has not suffered any dramatic economic collapses. The Uribe administration seeks to maintain prudent fiscal policies and has pursued tough economic reforms including tax, pension and budget reforms. A recent U.S. Agency for International Development (USAID) study shows that Colombian tax rates (both personal and corporate) are among the highest in Latin America. The unemployment rate in December 2005 was 10.4%, down from 15.1% in December 2002. The sustained growth of the Colombian economy can be attributed to an increase in domestic security, the policies of keeping inflation low and maintaining a stable currency (the Colombian peso), petroleum price increases and an increase in exports to neighboring countries and the United States as a result of trade liberalization. The Andean Trade Preference and Drug Eradication Act (ATPDEA), which will expire on December 31, 2006, also plays a pivotal role in Colombia's economic growth. The conclusion of negotiations on a Free Trade Agreement in February 2006 portends further opportunity for growth once it is approved by the legislatures of both countries and implemented. Colombia's diverse climate and topography permit the cultivation of a wide variety of crops. In addition, all regions yield forest products, ranging from tropical hardwoods in the lowlands, to pine and eucalyptus in the colder areas. Cacao, sugarcane, coconuts, bananas, plantains, rice, cotton, tobacco, cassava and most of the nation's beef cattle are produced in the hot regions from sea level to 1,000 meters elevation. The temperate regions--between 1,000 and 2,000 meters--are better suited for coffee, flowers, corn and other vegetables, and fruits such as citrus, pears, pineapples and tomatoes. The cooler elevations--between 2,000 and 3,000 meters--produce wheat, barley, potatoes, cold-climate vegetables, flowers, dairy cattle and poultry. Colombia is the United States' fifth-largest export market in the Western Hemisphere behind Canada, Mexico, Brazil and Venezuela and the largest agricultural export market in the hemisphere after the North American Free Trade Agreement (NAFTA) countries. It is also the 27th largest export market for U.S. products worldwide. U.S. exports to Colombia in 2005 were $5.4 billion, up 20% from the previous year. Corresponding U.S. imports from Colombia were $9.4 billion, up 21%. Colombia's major exports are petroleum, coffee, coal, nickel and nontraditional exports (e.g., cut flowers, gold, bananas, semiprecious stones, sugar and tropical fruits). The United States remained Colombia's largest trading partner in 2005, representing 40% of Colombia's exports and 29% of its imports. The EU, Japan and the Andean countries also are important trading partners. Mining, manufacturing industries and oil continue to attract the greatest U.S. investment, which accounted for 13% of the total $10.2 billion in foreign direct investment in Colombia in 2005. Colombia has improved protection of intellectual property rights through the adoption of three Andean Pact decisions in 1993 and 1994 as well as an internal decree on data protection, but the United States remains concerned over deficiencies in licensing and copyright protection. Colombia has considerable mineral and energy resources, especially coal and natural gas reserves. New security measures and increased drilling activity have slowed the drop in petroleum production, allowing Colombia to continue to export through 2010 or 2011, given current production estimates. In 2005, gas reserves totaled 6.711 billion cubic feet. Gas production totaled 649 million cubic feet per day. The country's current refining capacity is 299,200 barrels per day. Losses from theft of fuel (gasoline) decreased from $59 million in 2004 to $46 million in 2005. Mining and energy related investments have grown because of higher oil prices, increased demand and improved output. The Pastrana and the Uribe administrations have significantly liberalized Colombia's petroleum sector, leading to an increase in exploration and production contracts from both large and small hydrocarbon industries. In 2002, royalties were linked to the size of the discovery as opposed to a flat rate. In 2003, a new oil policy created the National Agency for Hydrocarbons (ANH), which now administers all exploration and production contracts. Ecopetrol, the state-owned hydrocarbon company, must now compete alongside other hydrocarbon companies for exploration and production contracts, separating state roles as investor and resource administrator. State association contracts have dropped from 30% to 0%, allowing private companies 100% ownership upon exploration success. In July 2006, the Colombian Government announced plans to sell 20% of Ecopetrol to private investors. The country's oil industry has continuously been a target of extortion and bombing campaigns by the ELN and the FARC. Strong security policies and an offensive military posture had reduced attacks on pipelines. According to the Security and Democracy Foundation, this trend regressed in 2005 as attacks on infrastructure increased from 47 in 2004 to 117 in 2005. According to Ecopetrol, at the end of 2005, total oil reserves amounted to 1.4 billion barrels. Oil production amounted to 526 million barrels per day, and petroleum exports were 169 million barrels per day. The country's efforts in exploration during 2005 produced 19 million barrels of new reserves. Output also dramatically improved, due to an additional 35 new exploratory wells, 11,896 kilometers of seismic exploration and a lower drop in production--from 528 thousand barrels per day in 2004 to 526 thousand barrels per day in 2005. According to this new outlook, Colombia will become a net oil importer one or two years later that originally thought (by 2010 or 2011). In 2005, 31 new exploration and production agreements and 28 technical evaluation contracts were signed between private investors and the Colombian ANH, representing $367 million in oil investments. In 2005, Colombia was the largest producer in Latin America of coal (59 million tons) and ferronickel (39,696 tons). It historically has been the world's leading producer of emeralds, although production has fallen in recent years. In 2005, it was 6.74 million carats, generating $72 million in revenue. Colombia is also a significant producer of gold, silver and platinum. The United States is the largest source of new foreign direct investment (FDI) in Colombia by far, particularly in the areas of coal and petroleum. In 2005, new FDI totaled $10.2 billion, an increase of over 300% from 2004. The bulk of the new investment is in the manufacturing, mining and petroleum sectors. The only activities closed to foreign direct investment are defense and national security, disposal of hazardous wastes and real estate--the last of these restrictions is intended to hinder money laundering. Capital controls have been implemented to reduce currency speculation and to keep foreign investment in-country for at least a year. Likewise, in order to encourage investment in Colombia, Congress approved a law in 2005 to protect FDI and laws governing the investment for the productive life of the venture. In 1969, Colombia, along with Bolivia, Chile, Ecuador and Peru, formed what is now the Andean Community. (Venezuela joined in 1973 and announced its departure in 2005, and Chile left in 1976.) In the 1980s, Colombia broadened its bilateral and multilateral relations, joining the Contadora Group, the Group of Eight (now the Rio Group) and the Non-Aligned Movement, which it chaired from 1994 until September 1998. In addition, it has signed free trade agreements with Chile, Mexico and Venezuela. Colombia has traditionally played an active role in the United Nations and the Organization of American States and in their subsidiary agencies. Former President Gaviria became Secretary General of the Organization of American States (OAS) in September 1994 and was re-elected in 1999. Colombia has participated in all five Summits of the Americas, most recently in November 2005, and followed up on initiatives developed at the first two summits by hosting two post-summit, ministerial-level meetings on trade and science and technology. On March 22-24, 2006, Bogota hosted the Sixth Regular Session of the Inter-American Committee against Terrorism. The results thus far have been impressive, but much remains to be done. U.S. policy toward Colombia supports the Colombian Government's efforts to strengthen its democratic institutions, promote respect for human rights and the rule of law, intensify counter-narcotics efforts, foster socioeconomic development, address immediate humanitarian needs and end the threats to democracy posed by narcotics trafficking and terrorism. Promoting security, stability and prosperity in Colombia will continue as long-term American interests in the region. (tel: (571) 621-5042/7925/6838, fax: (571) 612-6838, email: 73050.3127@compuserve.com) Chapters in Cali, Cartagena, Medellin.